The European Union is threatening to crumble and markets are in turmoil. 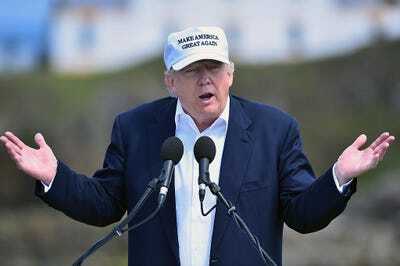 Nativism and bigotry are taking political center stage in the US and around the developed world. For decades, the generation of people between the ages of 52 and 70 — known as the Baby Boomers — have been controlling the planet. The consequences of this came into sharp focus last week in the UK. It was the Baby Boomer generation that voted overwhelmingly for Britain to leave the European Union in a bid for a return to isolationism, proving themselves all-too susceptible to the seduction of self-serving promises that leaders on the Leave side could never keep. British youth, meanwhile, are taking to the streets of London on Tuesday to protest the vote to leave. This merits examination. Young people from the US can learn a lot from what the UK is experiencing because our parents are likely just as awful. During the campaign, Nigel Farage, the face of the UK’s Leave vote made a distinct promise that he knew would appeal directly to the Baby Boomer generation. He promised to spend take the £350 million a week that he claimed was going to the EU to maintain the UK’s membership on the National Health Service (NHS). It’s England’s publicly funded healthcare service, and yes, it serves mostly the elderly. A few hours after the Leave vote won last week, Farage backtracked on that statement completely. “No I can’t [guarantee it], and I would never have made that claim. That was one of the mistakes that I think the Leave campaign made,” he said in a speech after the referendum. It’s hard to say voters were totally swindled here. Fact checkers wasted no time in pointing out that there was no truth to Farage’s statement from the beginning of the campaign, but Leave emblazoned the £350 million a week claim on buses anyway. Baby Boomers heard what they wanted to hear, and they voted for it in much greater volumes than younger people. What they wanted to hear was that they would be taken care of immediately, and that they would not have to worry about invisible people on the continent. What they didn’t want to hear was how leaving the EU would cut off opportunity (economic and social) for the people who would have to live with the vote for a long time — opportunity that is worth paying for. Again, it’s not like no one told them. Economists, financiers, political leaders and more warned them of the repercussions of a Leave vote. And in crushing the pound and UK stocks (especially banks), the market is telling them now. This kind of short term, me-first thinking is a hallmark of the Baby Boomer generation on both sides of the pond. Donald Trump is using the same kinds of promises to bring in Baby Boomers here in the US. He’s promising to cut taxes, an idea they have always loved, and not touch Social Security, a program more and more Baby Boomers are coming to rely on. On the latter point, Trump has come up against his own party. First he sided with House Speaker Paul Ryan, whose Poindexter obsession with debt and the budget fits in well with the GOP’s traditional commitment to keeping America’s finances in line. Ryan wants to figure out a way to cut the program in the present so that it’s around for future generations. The problem is, that’s a policy that doesn’t appeal to Baby Boomers, who after voting for tax cut after tax cut during previous administrations, want to make sure their retirements are secure. Forget what happens to their children (Generation X and Millennials). We should note that this sudden desire to spend money on Social Security doesn’t necessarily jibe with how Baby Boomers have treated government spending since they took power. Since the 1980s the big question in government budgetary policy has been ‘how much can we cut?’ not ‘where do we invest?’ and this has been showing in America’s education system and its infrastructure for years now. And so Trump has picked up that dog whistle and blown it. He now no longer wants to touch social security, but there will still be tax cuts (don’t worry mum and dad). Now to be fair, this cheap pandering from politicians like Trump and Britain’s Farage works because Baby Boomers actually go out and vote. That’s why they’re being seduced in the first place. Young people, by and large, cannot be seduced by this rhetoric (and based on Farage’s backsliding, that’s most of what it is so far). According to Harvard’s Kennedy School of Government Youth Poll, young people across the political spectrum overwhelmingly dislike Donald Trump. Clinton has 61% of young voters likely to turn out to the polls for her while Trump only grabs 25%. Part of this is because what Farage and Trump were both selling was a return to a world young people barely remember if they knew it at all. Years ago the world was bigger. Distances were greater, and there were more borders separating people and goods. Both of these men come from a world before globalization. And they think they can put the genie back in the bottle. To younger generations this seems impossible. Millennials are the most diverse (and largest) generation in history — so xenophobic, nationalistic arguments Trump and Farage have made make less sense to us than to our parents. The freedom of being able to move and learn in the physical world now mirrors what they can do with the internet in the digital world. So, what Trump and Farage are presenting isn’t just short term thinking. It is thinking that’s stuck in the past. It’s the kind of thinking that still frames the world in terms of our war between capitalism and socialism. Younger people are showing signs that they’re getting past that dichotomy. 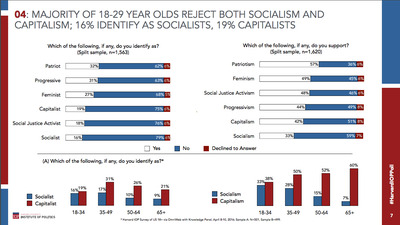 In Harvard’s poll they overwhelmingly said that they rejected both socialism and capitalism (see the chart to your right). They’re looking for something new. 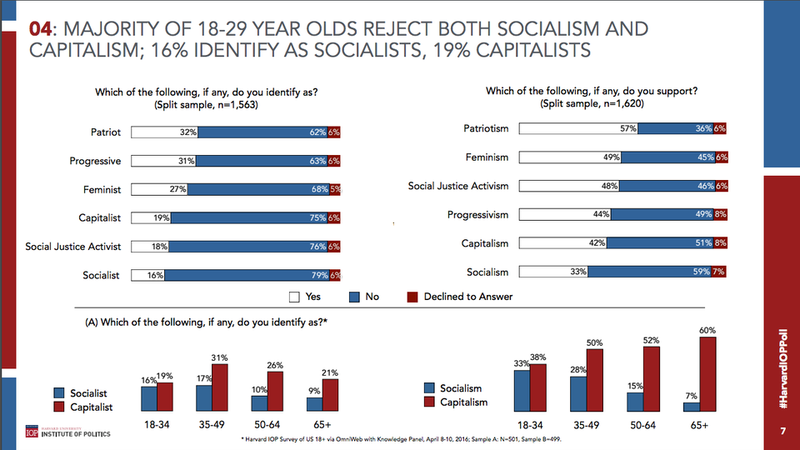 Perhaps this is why, according to the same poll, only 15% of the young people polled believe that the US is headed in the right direction. Half of the people polled don’t think our current leaders have the stuff to get us through (what seems like) tough times ahead. Now I hate to bring our grandparents into this, but they actually invested in our country. They passed the Federal Highway Act, which built the US Interstate Highway System, in 1956 and managed to avoid having a generational panic attack (like a Brexit vote, for instance) when that project wasn’t done until 1992. On the other hand, it was hard to get Baby Boomers to vote for spending on infrastructure development during the depth of the recession when Americans desperately needed jobs. And don’t even get me started on education spending as it relates to student loans. Our parents are the worst.